I say I am the Good Shepherd. So we cannot separate ourselves from Jesus because Jesus showed what humanity is all about. When he came to us, he did all these things as a human being and not as God. He was showing us what human life is supposed to be. By Jesus saying, “I’m the good shepherd,” Jesus was showing us what the most desirable human quality is. In our life journey we meet many shepherds who have guided us and showed us the way. Trying to be a good shepherd is what we should all strive for. Of course we cannot make ourselves good shepherds just because we want to. Deep inside we may take a contrasting attitude because we don’t want to have ownership of our spiritual life. Even though it is difficult to be good shepherds to each other, we should always keep that noble ideal. Always think about being a good shepherd, it has to be in our mind all the time. Just because it looks too high or too difficult, let us not give up on that idea because that is what Jesus showed us. I know we are far from being good shepherds and it is really hard to be a good shepherd, but let us always keep in mind that Jesus is calling us to be a good shepherd. As I look back on my life, there were many good shepherds that have guided me in my life. My parents, especially my mom, was a good shepherd to me. Good friends that I had, when I was lost, were good shepherds that guided me and showed me the way. Even strangers were good shepherds to me. The help that we receive make us thankful to those who have been good shepherds to us. In the same way I think we need to learn to be good shepherds to those who are in need. In our journey, there are many people who need some guidance. If we can be a good shepherd to them, how wonderful that must be. So in today’s passage Jesus says, “I’m a good shepherd” and this shows us concrete things about being a good shepherd. It shows us what is involved in being a good shepherd and Jesus teaches it to us practically and concretely in what he did. 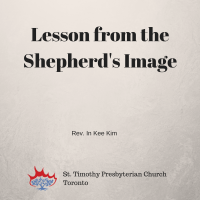 But how can you really be a good shepherd? I read the story several times and three words come to my mind: Care, intimate knowledge, and sacrifice. These three elements are essential elements of being a good shephard and supports the ideal of being a good shepherd. These three things have to be there. Everything stems from the heart of care. Care is a beautiful word. If you look at this society, you hear about care a lot. Pastoral care, terminal care, all kinds of care programs. This society is almost like it is based upon care and we are very familiar with the idea of caring for others. Sometimes in North America, when people are angry they say, “I don’t care.” “I don’t care” is such a cruel phrase. If one doesn’t care, some people will die. People need to take care of the elderly and sick. People get scared and lonely so they need to be cared for. People who are hurt need to receive care. Thousands of people died in Nepal and if we hadn’t cared, the people who were affected would have perished. Fortunately, the whole world is awakened by this tragedy so they were sent aid. That’s what humanity is all about. When somebody falls, we care. When somebody’s sick, we care. This most desirable human quality is to deeply care for the people around us. A caring heart has to be cultivated. Caring only comes when you put yourself in that person’s shoes, but how hard it is to put myself in another person’s shoes. We don’t want to do that because sometimes we are lazy, or sometimes we are too obsessed with our own self, our own agenda, and our own problems. Therefore we cannot really enter into that person’s shoes and know what that person is feeling, we don’t have this empathy. This world becomes more and more like that. We become so indifferent and we cannot feel for the pain of other people. Often people who are deeply cared for say this phrase: “I feel understood”, “This person understands my pain,” or “This person will understand the fear that I’m going through. This person understands the agony that I’m pulling through or the pain that I’m going through. This person understands me.” So from care, understanding happens. The second pillar is intimate knowledge and intimate understanding. When you care for other people, you start developing intimate knowledge or understanding about the person. But the person who doesn’t care, they have no ability to understand. When you start caring for people, you start having understanding about them so you become a bigger person and have deeper understanding. That’s why people who are cared for say, “I feel understood.” If caring becomes a part of my life, we automatically think about how they may feel and what they may experience. As soon as they hear you, they understand what you’re going through. Sometimes I go to other churches to preach and there are a lot of elderly people there. After my sermons, the people come to hold my hand and I feel that they understood that story because they’ve been living by being cared for. They knew exactly what I was talking about. There’s depth of understanding in caring and so listening is more important than speaking. Kay Lindahl said in her book, Practicing The Sacred Art of Listening, “Listening is not a passive activity. It is not about being quiet or even hearing the words. It is an action and it takes energy to listen.” How difficult it is to listen. You listen with your ears but you must also listen with your heart. Chinese people were very smart when they came up with their language. When you see the Chinese character of listening, this is how the word was made up: the left part is an ear, the right top part are eyes, and underneath at the bottom is the heart. So it’s not just about ears or eyes. There has to be the heart as the bottom foundation. Listening does not happen at the ear or the eyes, listening happens at the heart level. When we truly listen to other people, we understand them and their heart so our hearts can become connected. Jesus had a deep understanding about people because he had the heart listen to others. As soon as Jesus listened to people, he figured out everything about that person. He had incredible insight about people. Finally, the ultimate sign of being a good shepherd – sacrifice. Your care, your deep intimate knowledge, all have to be turned into sacrifice. Without sacrifice, being a good shepherd is impossible. It is the most beautiful thing that a person can do for another person. Jesus’ cross is a symbol of sacrifice and Jesus did the most beautiful thing that any person can do for another person. If somebody asks you for the directions on the road, then what do you do? You have to sacrifice your time and effort and help that person. Sacrifice is part of being a good shepherd. Only when we are able to let go of our own needs for the sake of others is sacrifice possible. That’s what sacrifice is, you take your needs aside and you put the other person’s needs before in front of you. I just came back from a pilgrimage through Santiago with a group of 10 people. We walked more than 35 km a day so we walked over 40 000 steps. Despite the long walk, everybody was so helpful and cooperative. If everyone had not been that way the trip would have been a disaster. It wasn’t easy, but everybody pitched in to take care of each other in different ways. Everybody put others’ needs before their own. I realized that even simple prayer without sacrifice is impossible. When you do not embrace other people’s sickness, suffering, pain, and hardship, you cannot help the other person. That is the sacrifice. Before I came on the trip I had heard that somebody was sick so I decided to pray for that person for the whole day. Unfortunately the next morning I got blisters all over my feet, both right and left. Every time I took a step on the pilgrimage, I had an electric shock of pain. The next day, one of the group members who was an acupuncturist came to help me and he brought his special bandages. He took off my socks and he looked at my feet and put the bandages here and there. The next day, I was fine. When I think about this trip, I think about is the acupuncturist’s teeth. He always had these white teeth smiling from the first day to the last, even when everybody was so tired at the end of the trip. When we came back to Toronto, he goes around talking about all the happy times during the pilgrimage. That acupuncturist helped the other members as well. One person got sick and was crying and saying “Save me, save me” because she was hurting so much. Then this person did acupuncture and the girl got better. We also had a photographer among us who took beautiful photos. Everybody pitched in. Everybody put others needs before their own. What is community if not that? Without that, the trinity is not possible. Without that, humanity will collapse. Being a good shepherd to each other is what Jesus taught us in order to build a community otherwise we will destroy humanity. These are the pillars of what the most desirable human quality is: caring, intimate and deep understanding of each other, and sacrificing. I hope that we can be good shepherds to each other. That’s what a good life is all about, it’s not about going on vacation, drinking, and and all that. Life is good. Life is good when you could be good shepherds to each other.